Two separate teams of investigators identified compounds that were cytoprotective against alpha-synuclein-mediated toxicity by inhibiting the enzyme stearoyl-CoA desaturase (SCD). Inhibiting SCD reduced alpha-synuclein toxicity in human induced pluripotent stem cell neuronal models. The findings suggest that inhibition of fatty acid desaturation could be a therapeutic approach for treating Parkinson's disease and other synucleinopathies. Two teams of scientists have independently identified a new target involved in the toxic accumulation of alpha-synuclein, stearoyl-CoA desaturase (SCD), and have found that inhibiting the enzyme protects against alpha-synuclein-driven toxicity and neuronal cell death. This is the first time the enzyme has been shown to have a role in modulating alpha-synuclein, a key player in Parkinson's disease (PD). SCD seems to have an impact on lipid saturation, influencing vesicle trafficking and lipid homeostasis. Both studies offer biological evidence that inhibiting SCD could represent a novel therapeutic approach to treating Parkinson's. Both studies, one led by scientists at Harvard Medical School and the other at Yumanity Therapeutics, used an unbiased approach to “let the biology and the cell lead us to new pathways” involved with the development of Parkinson's, said Kenneth J. Rhodes, PhD, chief scientific officer of Yumanity. The four-year-old company licensed technology from Susan Lindquist's laboratory at the Whitehead Institute at the Massachusetts Institute of Technology (MIT). Lindquist, a biologist who died in 2016, was an expert on diseases triggered by protein misfolding. Dr. Rhodes is the senior author of the paper, published in December in Cell Reports. The other study, led by Dennis J. Selkoe, MD, the Vincent and Stella Coates Professor of Neurologic Diseases at Harvard and co-director of the Center for Neurologic Diseases at Brigham and Women's Hospital, was published on the same day in Molecular Cell. It was in the Lindquist lab that Daniel F. Tardiff, PhD, associate director of discovery biology at Yumanity, learned how to use yeast as a model organism for studying protein misfolding. When he left MIT to co-found Yumanity, he and his colleagues set out to use small-molecule phenotypic screening in yeast to find targets that alter alpha-synuclein levels. The goal was to identify molecules that alter protein misfolding, and then identify their targets. To do that, they worked to express human wild-type alpha-synuclein in yeast, triggering cellular pathologies similar to what is seen in human cells. Then they used large small-molecule libraries to test whether any of the drugs promote survival and growth of the yeast, which takes a hit under the influence of the aggregating alpha-synuclein. The Yumanity scientists identified a number of oxadiazoles that protected the cells from alpha-synuclein toxicity. One in particular, YTX-465, rescued neuronal growth by approximately 40 percent of the wild-type strain treated with the same concentration of the drug. Using a number of approaches in yeast, the scientists showed that the drugs were working on Ole1, the yeast homologue of SCD in humans. The enzyme is needed for the biosynthesis of monounsaturated fatty acids. They also showed that oxadiazoles inhibited yeast Ole, which led to the restoration of alpha-synuclein localization and reversed trafficking defects, according to Dr. Tardiff. The scientists believe that inhibiting Ole1 reduces the levels of unsaturated membrane lipids; this, in turn, protects against alpha-synuclein toxicity. This target may be important in the development of drugs for Parkinson's and other neurodegenerative diseases that involve an accumulation of misfolded alpha-synuclein, they proposed. The study authors reported that the rescue was selective for alpha-synuclein and showed no effect on amyloid-beta and TAR DNA-binding protein 43 aggregation. The SCD enzyme has been linked to metabolic disease, primarily obesity. The pharmaceutical company Merck launched a clinical study of an inhibitor of the enzyme, but a phase 2 study found it didn't work. SCD has never been linked to a neurodegenerative disease. Humans have two forms of SCD: SCD5 is predominantly seen in the brain and pancreas; SCD1 is expressed all over the body. Yumanity is developing molecules that target SCD5 and, with lesser potency, SCD1. The company is about to conduct toxicity evaluations in preparation for designing a clinical trial in humans. “Our approach to identifying potential therapeutic targets for synucleionopathies such as PD is to use unbiased screening to identify compounds and targets that protect yeast and neurons from the consequences of protein misfolding,” added Dr. Tardiff. In 2001 Dr. Selkoe and his colleagues published their first paper offering evidence that alpha-synuclein could bind to fatty acids and that fatty acids influence the natural state of the wild-type alpha-synuclein protein. Some years later Dr. Selkoe entered into a collaboration with MIT biologist Susan Lindquist, and scientists in the two laboratories set about to study the lipid changes that occur when alpha-synuclein is expressed in yeast, and later in mammalian neurons. The results of these experiments are outlined in the current study in Molecular Cell. The late Dr. Lindquist, who had been battling cancer during her collaboration with Dr. Selkoe, is a senior co-author of the study. Saranna Fanning, PhD, now in the Selkoe lab, and Ulf Dettmer, PhD, an assistant professor at Brigham and Women's and Harvard Medical School, performed unbiased screens in yeast expressing human alpha-synuclein that revealed changes in neutral lipids, with especially high accumulation of oleic acid (a monounsaturated fatty acid) and diglycerides. Cellular lipid composition and metabolism were altered in several ways when alpha-synuclein was expressed in the yeast models. The principal findings from yeast were then confirmed in rat neurons and human-induced pluripotent stem-cell-derived neurons. Based on their experiments, the investigators concluded that alpha-synuclein, when in excess or bearing a Parkinson's disease-causing mutation, alters lipid homeostasis, especially that of monounsaturated fatty acids. The research team also identified SCD as a target and found that inhibiting SCD could be useful for PD therapeutics. The team showed that SCD inhibition, by reducing the excess oleic acid levels, could rescue alpha-synuclein toxicity and related signs of neurodegeneration. Inhibiting the enzyme also decreased the number of round alpha-synuclein-positive inclusions in neurons expressing certain mutants and also increased the formation of native alpha-synuclein tetramers. With the latest study, they have shown that inhibiting SCD enables excess monomers to reassemble in part into their normal tetrameric state. Dr. Selkoe had reported in the Nature paper that normal tetramers are more resistant to alpha-synuclein aggregation than monomers. •. Fanning S, Haque A, Imberdis T, et al Lipidomic analysis of α-synuclein neurotoxicity identifies stearoyl CoA desaturase as a target for Parkinson treatment https://www.sciencedirect.com/science/article/abs/pii/S1097276518309985. Mol Cell 2018; Epub 2018 Dec 4. •. Vincent BM, Tardiff DF, Piotrowski JS, et al Inhibiting stearoyl-CoA desaturase ameliorates α-synuclein cytotoxicity https://www.cell.com/cell-reports/fulltext/S2211-1247(18)31774-1. Cell Rep 2018; Epub 2018 Dec 4. 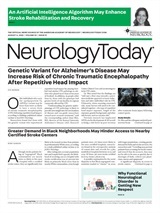 Neurology Today19(3):10-11, February 7, 2019.